Last week I received my copy of Susan Branch's A Fine Romance. I've admired Susan's style for many years, and have enjoyed reading her blog. Oddly, this is the first book I have of hers. I'm so enjoying her rambles through the English countryside with her husband Joe and am thinking that in a few years, a trip to England might be the thing to do. We'll see. I'm pacing myself with this book - a hard thing for me to do. Does it seem to you that some summers are filled with more home maintenance projects than others? This is one such year. I've never liked the outside of our home - pale vinyl siding, and a few years ago when we added the garage we had the idea of trimming it with this pinky beige color. It's really awful and I can only assume that I was on some sort of medication at the time I chose it. Anyway, this is the year it disappears. I'm working on that. I also painted the front door which will be revealed sometime. Maybe. We're having a few cooler days now and painting isn't a bad thing to be doing. All that stretching has to be good for me, too. 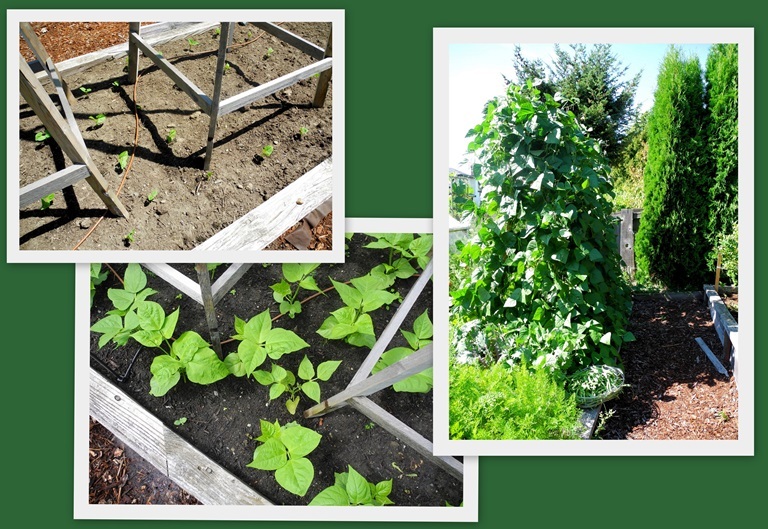 Every year I plant green pole beans around the wooden teepees Tim built for me. Every year I wonder how those little plants will ever grow to produce beans. And every year I'm wowed. There are lots and lots of green beans to harvest and the plants have entwined themselves around the teepees, the kale, the rhubarb and anything else they can reach. I pick green beans every other day, cook them for us, freeze them for soups and stews, and give them away. Want some? No no Lorrie, I don't want them! I am having a hard time keeping up with ours which are yielding pounds daily! We planted too many! Thank you for your lovely comment on our party. I DO want some! Its sad, the farmers' markets and even the nicer grocery store don't have decent green beans now - if I had them in my garden this would be the peak of the season. Maybe I will have to squeeze them in again somehow next summer. You are the second blogger I have read today who is happily reading Susan Branch's latest book. A trip to England would be something you would surely enjoy. I like your towers and think I could use some for tomatoes. I'd love to have some beans for salads...love them raw. Oh of course I want some - nothing tastes quite like a freshly steamed green bean. I'm glad your garden is doing well - and the painting is going fine. I'll be waiting to see the new door too. We had a lot of rain down here last night - so I suspect that you might have also. Today was cloudy and coolish - but pleasant. My grandsons were at the NW WA fair lasts night - in the rain. I guess PNW kids don't melt. Do you pickle dilly beans? My brother grows and preserves these wonderful treats, and we all try to stay on his good side, hoping for a jar or two . . . so good! The only way I'll love a green bean is straight from the garden to the steamer to the table so yep... I would love some! I laughed about your comment regarding the color and being on medication. I think the person who chose our siding color must have been on some, too. I love Susan Branch and I loved following her blog posts when she took the trip last year. Have you enjoyed the book? Recently when I mentioned Susan Branch to a friend she responded that she'd outgrown SB. I thought such an odd comment as her work seems timeless. Yes please, I'd love some :). I do love green beans fresh from the garden. Susan Branch's new book looks like an ideal one to sit and savor. I can imagine a lot of readers will be yearning for a trip to England after reading it. LOL - your comment about being on some kind of medication when you chose that color made me laugh. Too funny. I can relate to that what was I thinking moment. It seems there are always outside chores and repairs in the summer doesn't it. I don't think we did much this year and I really want 2 new walk in garage doors. They look just awful! Being away for almost 3 weeks didn't help. I like your bean teepees or obelisks. Our son planted green beans and I picked a bunch yesterday to enjoy for supper tonight. Where can I find Susan Branch's blog? Have a great weekend. What color of trim are you thinking of going with? We will be replacing shingles and keeping the white siding, but want to spruce the trim color up.....hmmm what to pick? Have a great rest of your weekend Lorrie. I do detest chores!!! But I love the phrase "Thank God for daily obligations." And I guess those fall into that. Your garden is amazing! It alway seems like there is a task that needs to be completed! And I would love to have some of those beans! Shall I send Marty over, LOL? Yes...I want some...since I never planted any this year. Hope you can get all your projects over with...and enjoy the rest of the summer. Thanks for the book recommendation, I'm always looking for new authors to add to my reading list. Love that you are reading Susan's book. I thoroughly zoomed through it and now want to read more slowly.